Francesco José de Goya Lucientes (1746-1828) and William Hogarth (1647-1764) were the most remarkable artists of their times. Both were famous painters, but their most compelling works are the prints that they made and published themselves. Often produced in serial format, like graphic novels, the prints were aimed at a more popular market than their paintings. This is the first exhibition to show Goya and Hogarth’s works together. It features a hundred prints, selected from the stellar collections of the Whitworth and the Manchester Art Gallery, and provides a unique opportunity to compare their extraordinary graphic work. Both outsiders, Hogarth and Goya cast their candid gazes on their dysfunctional societies. Poverty, homelessness, warfare, violence, cruelty, sexual abuse and human trafficking, social inequity, political corruption, racism, superstition, hypocrisy, rampant materialism, nationalism, mental illness, and alcoholism all were subjected to their forensic scrutiny – no topic was off-limits. These challenging prints provoke a spectrum of responses, including shock, discomfort, laughter, pleasure, pain and empathy. 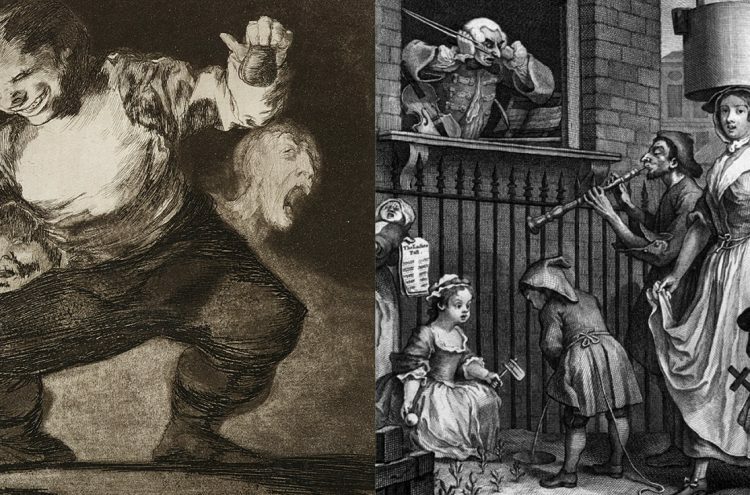 The scenarios that Goya and Hogarth unflinchingly depicted are startlingly familiar to the contemporary viewer, and the images provoke us to turn our embarrassed gazes on our own society, and ourselves. The exhibition is also timely, as it takes place during the troubled run-up to Britain’s exit from the European Union. Hogarth and Goya both lived through extended periods of warfare with France, and Hogarth claimed to hate the French, although he was a frequent visitor to Paris and hired French engravers for his print series Marriage a-la Mode. Angry, troubled, and ambivalent, Hogarth seems to embody the tortured mind-set of Britain on the eve of Brexit.